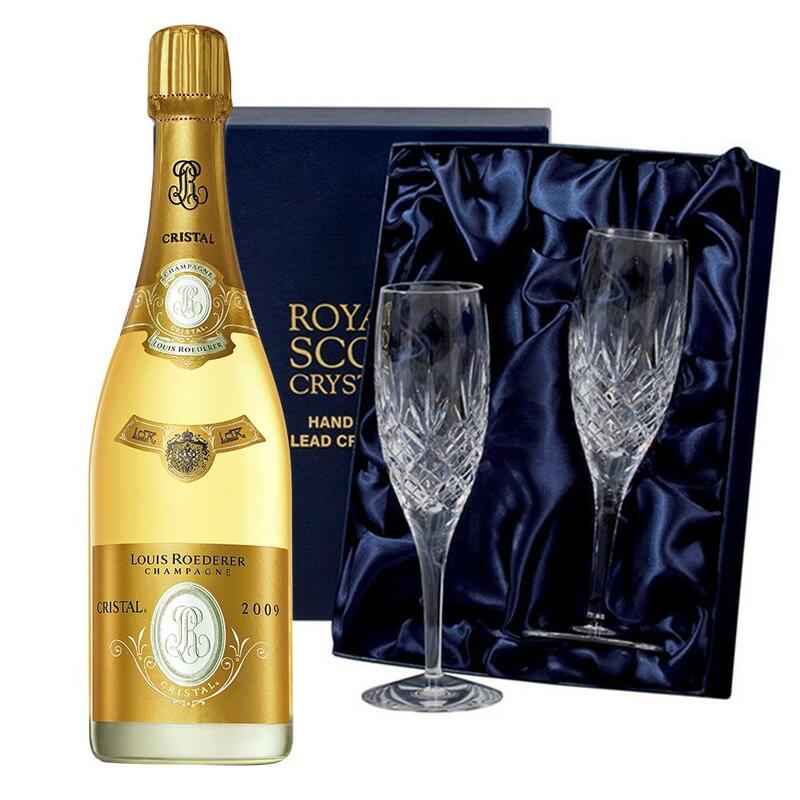 A bottle of Louis Roederer Cristal Brut Vintage 2009 Champagne 75cl packed with 2 Royal Scot Presentation Boxed Edinburgh Champagne Flutes A pair of beautiful hand cut lead crystal Flutes, inspired by the great tradition of the City of Edinburgh. A City which has created a legend out of glass for over four centuries. The newly born Cristal 2008 comes to us with a patient heart, full of promise. It has been shaped by time and by its unique chalky soils and is now ready for us to enjoy after ten years of ageing. From the chalky depths, Cristal has forged its identity in these limestone soils which reflect the rays of the summer sun and capture the soft light of winter. Cristal has a restrained strength and a pervasive purity, like a lithe ballerina’s impossibly graceful leap through the air. A reverberation of bright fruit, an initial pulse which penetrates to the core and beckons contemplation. The limestone gives the wine its beautifully firm body, chalky concentration, as well as an ethereal lightness and delicate tension. This product is hand packed onsite by Champers Direct, and is not affiliated with any other brand. Champers Direct is responsible for this product combination/set.